Even though English is the official language of Belize, many still struggle in the pronunciation of the language. Children with Spanish speaking parents commonly face the most literacy issues while in school. For the past week, Monday, January 25th to Friday, January 29th, an American retired teacher has been providing reading lessons to challenged Holy Cross Anglican Primary School students. 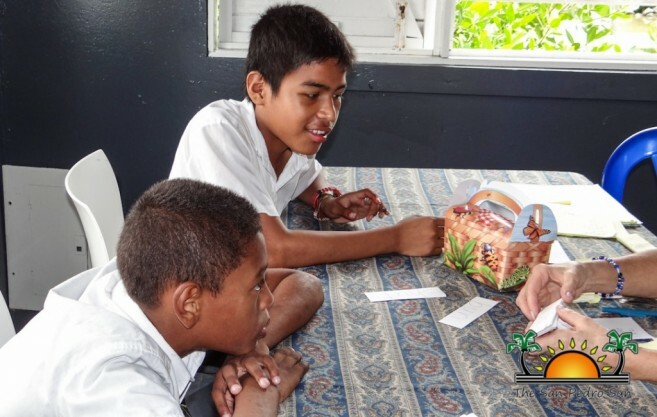 Julie Bigaouette has been providing this invaluable service to island children for the past three years, teaching them the proper pronunciation of words and improving their reading skills. With 34 years of teaching experience and 12 years as a special education teacher, Bigaouette knows exactly what challenges certain children face when it comes to literacy. “What I’m doing with each of the children I meet with is to identify their specific need and what type of remediation they need. We then go through the letters, sounds, and blending words. I eventually start practicing reading with them to give them some fluency in their literacy,” said Bigaouette. The students benefiting from the training were identified by the school’s administration and teachers. “What seems to be the issue in literacy, both here in Belize and the USA, is that in every class there is a varied levels of abilities and meeting the needs of each child is difficult. It is hard to differentiate the curriculum to ensure there is something to fit each child’s learning level. So what I am focusing on this week is to meet the children at their reading level, helping them so that they can feel successful, validate what they already know and emphasize where they need help,” said Bigaouette. Bigaouette encourages all teachers to try to identify what the needs of their students, as this makes it easier to find approaches to assist them. “Even some of the students in the upper standards are still reading at a primary level and that can be very discouraging. By the time they are finishing school, they recognize that they are not able to read most of what is given to them and this diminishes their self-esteem. We as teachers need to help reaffirm all children of their potential and validate what they do well. We need to make each child know they are valuable in a class, as well as teach other children to be kind and considerate of one another,” said Bigaouette. Holy Cross Anglican School extends a heartfelt thank you to Bigaouette for her continued service to the education of Belizean children.